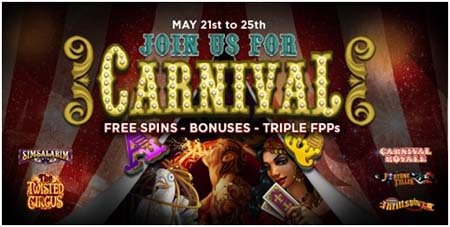 NextCasino has started their very nice "Join us for Carnival" today! and play their Carnival Games beetween today May 21st until May 25th 2014. The Carnival slots are: Thrill Spin, Fortune Teller, Simsalabim, Carnival Royale, The Twisted Circus. To start the promotion, existing, active players have been credited with 5 free spins (no deposit) on the video slot Simsalabim. If you prefer playing via your mobile device, these free spins will be playable in Fruit Shop Touch as an alternative. Log in to your Next Casino account and launch the game Simsalabim to check if you got the free games too.